The idea of construction of the HPP “Buk Bijela” on the river Drina from the 1970s is still valid and could be realized in 2016, despite of years of strong opposition by local citizens, NGOs and experts. The construction of the Hydro Power Plant (HPP) “Buk Bijela” on the river Drina in Bosnia (flowing from the Montenegrin rivers Tara and Piva) started in the 1970s was stopped in 1974 because of the huge opposition of domestic and international experts - over 500 scientists from around the world, as well as the World Congress of geographers in Edinburgh in 1984 were against this project because of the catastrophic consequences on the environment. In 2003, the Joint Committee of the Republic of Srpska and the Republic of Montenegro (at that time still part of The State Union of Serbia and Montenegro) for the construction of HPP “Buk Bijela” harmonized the Agreement on the implementation and construction of this hydroelectric system, that the produced electricity would be divided in a ratio of 70/30 per cent in favor of Bosnia and Herzegovina. The construction of the HPP would cause flooding of the canyons of the rivers Tara, Piva and Sutjeska in Montenegro. The Tara River basin is recognized as a World Biosphere Reserve – the UNESCO «Man and Biosphere» (M&B), and a segment of the Tara Canyon is listed as a UNESCO World Natural Heritage site. Other parts of the canyon are zoned with a special protection regime within the Durmitor National Park. Besides, since 1991 the Republic of Montenegro has declared itself an Ecological State, establishing the national and legal basis for the relation to nature, and committing itself to its protection in accordance with: The UN 1972 Declaration on Human Environment, The 1972 Convention Concerning the Protection of the World Cultural and Natural Heritage, The World Charter on Nature (1982), and the Rio Declaration on the Environment and Development (1992). In 2004, in a reaction to the project, the NGO "Most" from Žabljak, Montenegro, stated that the flooding of the Tara River canyon would affect the natural equilibrium of the entire region and would represent a violation of the Natura 2000 system; The Seville Strategy for Biosphere Reserves 1995; and the Paris Convention for the Protection of Natural Heritage from 1972. The citizens and environmental NGOs organised protests, an online petition, and other forms of media campaigns joined under the name “I don´t want a swamp, I want Tara”. The NGO "Most" received support from the "European Nature Heritage Fund - Euronatur" from Germany and "IUCN Europe", as well as from a large number of environmental NGOs and individuals in the region. Together with other 30 NGOs from Montenegro they drafted the Declaration on the Protection of the Tara River, asking for respect of its ecological statues, and a possibility of referendum in which all citizens of Montenegro would voice their opinion. Also, UNESCO and IUCN strongly opposed the project and USAID said that construction of the system “Buk Bijela” is not economically justified. Consequently, The Parliament of the Republic of Montenegro adopted The Tara Declaration, while the Bosnia and Herzegovina Ministerial Council has demanded that the Republic of Srpska authorities reconsider the realization of the project. Finally, the project was cancelled by a decision of the Government of Montenegro. In 2012, the Republic of Srpska (RS) initiated a new project including the establishment of a joint company with the German company RWE Innogy and Elektroprivreda RS, with the ownership share of 60 versus 40 per cent in favor of the German partner. The construction of HPP Buk Bijela, Foča, Paunci and Sutjeska was planned for 2014, with total power of 260 MW, and at a cost of 623,647,600 US dollars. RWE's study reached the conclusion that only the construction of HPP Buk Bijela is economically viable, while the other three were not. Once again local NGOs from Montenegro, led by Green home and Ozon stood up against the project opposing the adoption of project EIA finding the project unsustainable and causing negative impact in a trans-boundary context. The Government of the Republic of Srpska and the company RWE Innogy were unable to agree on a concession fee, and the foreign partner withdrew from the project implementation in June 2013. At the beginning of 2016, the ministry of energy of the RS announced it will award concession for the construction of the HPP Buk Bijela to the “Hidroelektrane na Drini”, a subsidiary of Elektroprivreda RS. The HPP will have power output of 93 MW and annual electricity generation of 332 GWh. The total investment is estimated to 220 million USD and will be provided from loans. The project has already obtained some necessary documentation, including EIA study. However, as of May 2016, the negotiations on the concession are still ongoing. Project Details The HPP “Buk Bijela” proposed location at River Drina was 10 km downstream from the town Foča, 9 km upstream from the town Srbinje, and 8 km from the Montenegrin border. The HPP would have power of 450 MW, generate a billion and one hundred million kWh of electricity per year, and water reservoir of 410 million m3 capacity. Building HPP Buk Bjela would cause flooding of around 12 to 18 km of the Tara canyon. The project plan from 2012 proposed building four HPPs with a total power of 260 MW. Level of investment in 2004 was 544,663,300 USD and in 2012 623,647,600 USD (for four HPPs). Development of Alternatives NGOs have been suggesting improvement of regional energy strategy, acknowledgment of public opinion, application of modern standards of environmental protection, and cancellation of the agreement on consensual use and distribution of hydro-power energy signed by B&H and Montenegro. Why? Explain briefly. The project of HPP "Buk Bijela" construction was renewed and cancelled three times in the past. 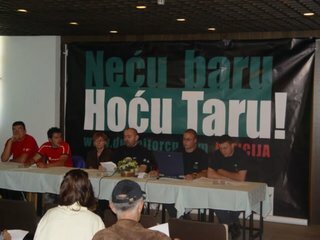 Both in 2004 and 2012 the project faced opposition by NGOs from Montenegro. In 2005 the project was stopped by the Parliament of Montenegro adopting the Declaration on River Tara proposed by NGOs and citizens, while in 2013 it was because of the lack of the agreement on a concession fee among the Government of the Republic of Srpska and the investor. Currently, the Government of RS is negotiating the concession for construction of the HPP with the “Hidroelektrane na Drini”, a company under the state-owned power utility. The construction of the HPP and flooding the canyons of rivers Tara, Piva and Sutjeska would violate the directives of Natura 2000 system: the Bird Directive (79/409 EEC) on the protection of birds living in nature, and the Habitat Directive (92/43 EEC) on the protection of natural habitats and wild fauna and flora; the Paris Convention for the Protection of Natural Heritage from 1972 –that say that UNESCO should be informed first, before taking any action within the protected area, in this case UNESCO was informed by NGO; the Seville Conference from 1995 –providing the legal framework for the functioning of biosphere reserves. Isplativa samo HE Buk Bijela? Za dvije godine prva hidroelektrana?